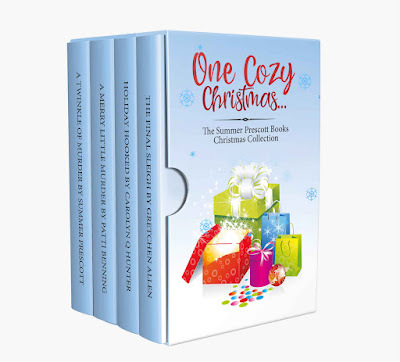 Get into the Christmas spirit this holiday season with all of us at Summer Prescott Books Publishing by picking up your copy of the One Cozy Christmas box set, featuring new stand alone cozy mysteries by myself, Gretchen, Summer, and Patti. It's out today! My story is something a littler different than I've tried before and is inspired by the Miss Marple short stories by Agatha Christie which I've been reading in the evenings with my husband. In my new tale, an elderly woman must recall the past few evenings following up to a murder in her local retirement community in order to gather enough clues to pin down the real killer. Time in the story jumps from the present, with our main character talking to the police detective, to the past where she interacts with the victim and suspects. As she completes her statement to the police, she begins to solve the case on her own. The spirit of Christmas is in the air at Sweet Hills Retirement Community . . . but so is murder. Seventy-nine year-old Agatha Reiner is determined to enjoy this Christmas season. Despite the fact that her only daughter is on the other side of the country, Agatha is making the best of the holiday cheer by eating Christmas cookies, listening to carols, snuggling up with her dog Aki, and crocheting doilies for all her neighbors in the retirement community. Unfortunately, it seems that not everyone is in a festive mood. When Agatha stumbles upon a body, police suspicions turn toward her. It doesn't help that she was presumably the last one to see the victim alive and the detective on the case seems to think she's nothing more than a dotty old woman with a jealous streak. Agatha realizes it is up to her to recount her time with the victim, step-by-step, clue-by-clue, to solve this mystery before she finds herself behind bars for the holidays. You can pick up your copy of One Cozy Christmas for a limited time on Kindle for only 99 cents! Merry Christmas and happy reading! Carolyn Q. Hunter is an author of paranormal and cozy mysteries for Summer Prescott Books Publishing. 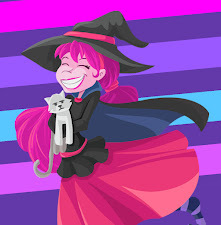 She graduated with a bachelor of the arts in English with an emphasis in Creative Writing. She is a Colorado native and works from home where she lives with her two cats. You can learn about all of her newest updates by following along on Facebook and Twitter.